Data quality is critical at institutions such as universities. This post, one in a series on data quality, introduces data quality programs. Learn about the tasks involved and the benefits of a data quality program. What is a data quality program? A data quality program consists of planned work that is predictable and measurable. The purpose of a program is to reduce risk and increase trust. The benefits of a program are certitude about the quality of data, and confidence in fixing issues as they arise. A quality program has three work areas - codify business rules, measure how data complies against the rules, and establish a repeatable process that manages data quality issues. These work areas are related. When a user reports a data inaccuracy, a rule can be created to prevent the inaccuracy from reoccurring. 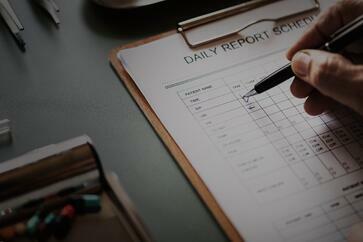 Data is assessed against rules on a scheduled basis so that inaccuracies can be discovered proactively. Institutions are more successful if they implement the work areas sequentially. Start with recording data rules, then establish data assessment against the rules, then implement a process to fix issues as they arise. Three to five months is a realistic timeline to follow for implementing all of the work areas. Why should you have a plan? A plan increases trust in data in several ways. If the quality level of a data set is labeled Very Good or High and a user gets an unexpected result within a report, the user is more likely to look for an error in the logic of the report query than to suspect that the data itself is inaccurate. A related aspect of data trust is responsible use. If a user knows that the level of quality in the data they want to use is poor, yet that data set is the only one available to them, they can use their own judgement regarding the decisions they are willing to make based on that data. They might risk a minor decision on poor quality data, if that data is all they have to work with. A data quality program also increases trust in the people who manage data. If a user can easily submit a quality issue and receive timely updates on their submission, they are more likely to trust that staff who perform other data management tasks are competent. Users are also more likely to submit issues and believe that the institution values data if they have a good experience when they submit issues. People use data to make strategic decisions. If data is inaccurate, decisions are compromised. A quality program reduces the risk of inaccurate decisions. If you need help in implementing data governance remember that IData provides data governance services. A data governance solution like the Data Cookbook can help in successful implementation of data governance at a higher education institution. Feel free to .